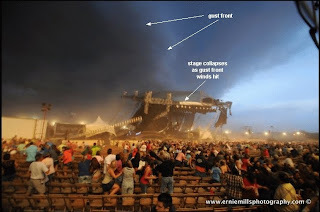 The 2011 tornado death toll - 2nd worst in U.S. history! I don't think most people who hear this in passing on TV comprehend how huge this is. In this day and age, that number is incredibly sobering! (See how dramatically 2011 stands out in the chart above among the last 50 years of U.S. tornado deaths.) Many of my colleagues, myself included, thought we would never see such huge death tolls again with the warning systems that are now in place in our country. Given the violent tornadoes in 2011, without our warning systems, the death toll in 2011 would certainly have been worse. But I also think things could be better. The NWS assessment from Joplin earlier this year concluded there is considerable "desensitization" to warnings in our population from perceived overuse of sirens and warnings. - Continued and ongoing public education is clearly needed about the importance of severe weather awareness and safety. - Though not talked about much, siren policies across the country could be more standardized and less confusing... there are big inconsistencies regarding how sirens in different areas are used and activated. 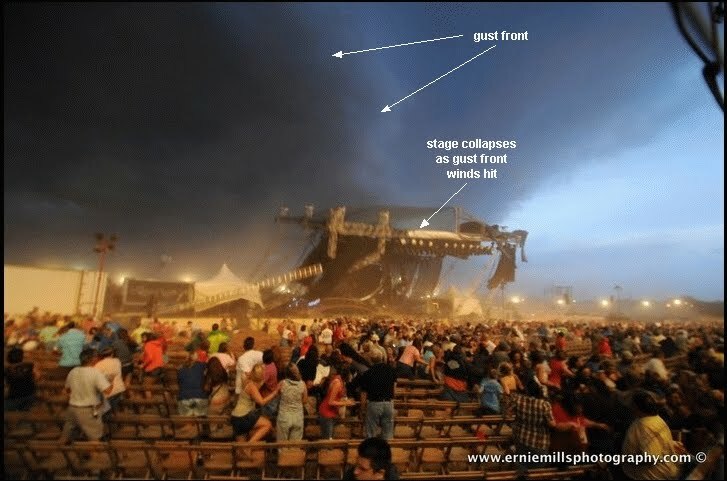 For example, some cities such as Joplin run them in shorter 3-minute bursts and then stop (as on the Joplin tornado day) which can be confusing to people in the most dangerous situations (when the sirens stop, is the danger past? ), while other cities run them longer. And in many metro areas, sirens tend to be an all or none proposition until technology is installed to activate them only for localized areas directly threatened by an approaching tornado. Siren policies and equipment (as well as the NWS interface with those who activate them) appear to need closer examination and standardization between local governments so we don't inadvertantly train our citizens to ignore them due to a perceived "cry wolf" factor. - If the NWS endorses use of "tornado emergency" statements to alert populated areas of imminent danger to life, then they can be more consistent in using them. If there was ever a situation that cried out for a tornado emergency statement conveying increased urgency, it was Joplin last May 22nd where 161 people died. But none was issued. By around 5:38 pm when the tornado was entering Joplin (about 20 minutes after a standard-worded "radar-indicated" tornado warning and 3 minute siren burst), there was enough information from radar and spotters to quickly issue a strongly-worded tornado emergency statement for local Joplin media, adding urgency and emphasis in a dangerous life-threatening situation. This would have been timely enough to possibly save some additional lives in spite of the hard-to-see and rapidly-developed violent tornado. The tornado warning was reissued at 5:48 pm with much stronger wording, but why wasn't an urgent tornado emergency statement issued 8 to 10 minutes earlier? I hope some lessons from last year's tornado disasters (unprecedented for our modern technological age) result in growth and learning for all of us, as well as better tools and preparedness in 2012. Some extremely sad news today... Long-time Kansas City meteorologist and weathercaster Don Harman died yesterday. 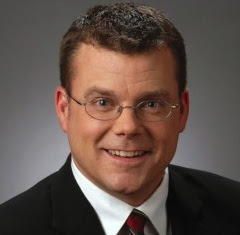 He worked at WDAF-TV since 1999, and was very popular on their morning show. Don had an awesome sense of humor, both on-air and off. He was always enthusiastic about weather, very knowledgeable, and a great communicator. 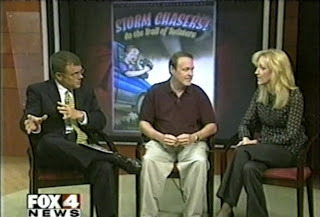 My wife Shawna and I always enjoyed watching him on TV, as well as seeing him at AMS meetings, and have fond memories of the time a few years ago when he interviewed us about our kids book on storm chasing. He was a friend, and we are quite taken aback today at his passing. With all the posts and discussion Shawna has been monitoring today on Facebook, it is clear that Don was an important part of KC area mornings for many many people, and will be missed beyond words. No one can replace him. I've gotten some private responses and discussion about my post last week regarding the Joplin tornado and the use of SRH (storm-relative helicity) and CAPE combinations to assess "more dangerous' tornado enivronments. "...one problem with what [Jon] is suggesting regarding enhanced warning wording in situations with unusually favorable environments for strong tornadoes might have the unintended effect of contributing to the false alarm problem. I am referring... ...to situations with unusually favorable parameters and tornadic radar signatures, but no "ground truth" confirmation of actual tornadoes at the time the warning is issued... ...On the same day [as Joplin]... ...I was chasing east of Hermann, MO, (west of STL) where the SRH was 300 and the CAPE was 3000. I observed three supercells between around 4 and 7 p.m. that day, two of which were TOR-warned... ...The storm in that area on Jon's 5 p.m. image is the second of the three I observed... I observed strong rotation in this storm, but neither it nor any of the three supercells I observed ever produced a tornado..."
John makes an excellent point. It is a gross-oversimplification to use only the 2 parameters I've discussed so far (SRH and CAPE) for assessing supercell tornado environments. There are most certainly other important ingredients and issues to look at. The situation John has outlined also is a reminder that the decision to use enhanced wording or a "stronger warning" is not simple. Let's look again at May 22nd, this time at the area where the storms John observed occurred. The 1st graphic above (from my previous post, but with arrows indicating the storm area west of St. Louis) confirms that CAPE and SRH were also large over eastern Missouri at late afternoon on the Joplin day, and would fall well above the red curve on my scatterdiagram (not shown). The 2nd graphic above (also repeated from my previous post) also shows the CAPE and SRH axes on May 22nd from a wider view, as well as EHI (energy-helicity index, combining the two parameters into a single dimensionless number), with the eastern MO storm area indicated by small black arrows. All this information suggests that potentially deadly supercell tornadoes were also possible in eastern Missouri, with large CAPE/SRH/EHI indicated here. 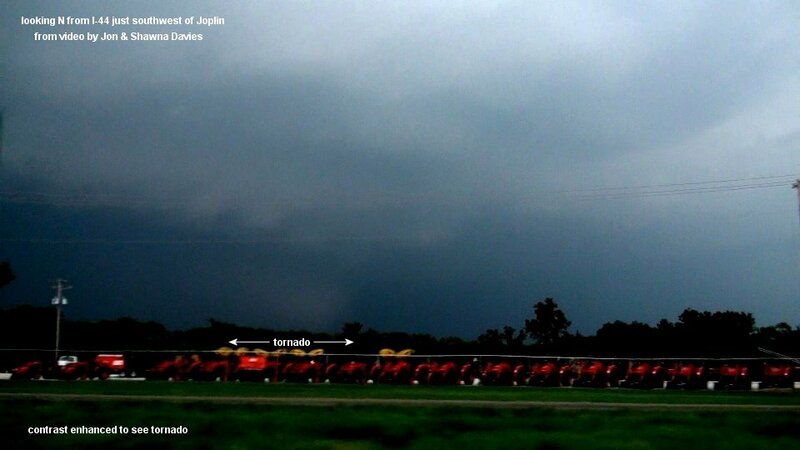 But as John noted, tornadoes did not occur, even though storms were rotating. A closer look at both graphics also shows that the storm area west of St. Louis, unlike the Joplin storm, was on the eastern side of the instability axis moving _away_ from the largest helicity and largest CAPE, and moving _toward_ an area of increasing MLCIN (light blue; SBCIN was even larger near St. Louis, not shown), suggesting some increasing low-level stability as storms moved toward the Mississippi River. Strong tornadoes can certainly occur on the east side of an instability axis, but are almost always near a warm front or within an area of warm advection in low-levels (increasing warmth and moisture) where SRH grows _larger_ as one moves east or northeast into or across the warm advection area. Notice that this was _not_ the case on March 22 in eastern MO, where SRH was trending downward some in value toward the St. Louis area. To look further at warm advection, the 3rd graphic above is again the Joplin day at 5 pm CDT (22 UTC), while the 4th graphic is 2 days later on 5/24/11 at 5 pm CDT for comparison; both EHI and temperature advection at 850 mb from the SPC mesoanalysis are shown in these 2 graphics, along with surface and radar features. Notice on both graphics, strong warm advection (indicated in pinks and reds) was co-located with the instability/EHI axes where violent tornadoes occurred in southwest MO (the 22nd) and central OK (the 24th), respectively. Also notice that on 5/22/11, the warm advection area was well removed to the southwest from the St. Louis area. In my database work, I've found that the stronger tornadoes are usually associated within or immediately to the south of strong warm advection areas, where lifting and SRH tend to be larger because of the associated atmospheric processes, along with increasing CAPE. Certainly, the positioning of the storm John was following, on the eastern side of the instability axis and away from the strong warm advection, would not preclude tornadoes from occurring, and a responsible meteorologist should clearly warn on a storm in that environment (as was done) _if_ significant rotation was indicated by radar and/or spotters. But the surface pattern on the 22nd, showing a surface low back in southeast Kansas with increasing SRH and convergence along with enhanced warm advection and energy focus in southwest MO, might suggest that the better potential for strong tornadoes would be there. Adding to this the maximized combinations of SRH and CAPE, southwest MO would be a "red flag" area for possible stronger wording in tornado warnings at late afternoon, while this would appear less true for eastern MO, given the location relative to the instability axis, warm advection, and surface/low-level pattern focus farther southwest. Again, to be clear in my recent posts, I'm not suggesting that we are able to forecast tornado intensity. And I'm not suggesting that enhanced wording in warnings be used every time SRH and CAPE appear to be in the "more dangerous" part of the scatterdiagram. But I am suggesting that we can detect and see at least some settings where stronger tornadoes are _more likely_. That involves knowledge of surface patterns where winds are backing and the atmosphere is focusing, where warm advection is occurring, thus increasing SRH and CAPE, along with other ingredients. That's a lot different than just looking at points on a diagram; it involves some understanding of important processes in severe weather production and a sense of atmospheric trends and evolution over an area being monitored. On the Joplin day, getting away from the SRH/CAPE points on a scatterdiagram, the atmosphere's _focus_ at late afternoon using surface and other basic weather products appeared rather impressive over southwest MO; look at the strong warm advection east of the surface low in the 3rd graphic above, and the "bulging" EHI pattern back to the northwest east of the surface low. The increasing SRH and CAPE values in this area just "sealed the deal", environment-wise. Chuck Doswell has written extensively about the danger of using "magic" numbers and indices in weather forecasting. Isolated numbers, indices, and points on diagrams have _no place_ in forecasting without basic knowledge and thoughtful consideration of other issues, such as the surface pattern focus and evolution, along with other ingredients. I apologize if I gave any impression otherwise, when I was oversimplfying using the SRH and CAPE diagram to make a point in limited space. I'll write more about this in future posts. Thanks, John, for sharing the situation above along with your thoughts and discussion. The NWS assessment report for the Joplin tornado came out last week (see here and here), 4 months after this horribly tragic event. I was glad to see that the authors of the report picked up on the public perception of high false alarms, and their tendency to ignore warnings and sirens because of an optimistic bias and the perception that "they happen all the time" in southwest Missouri. I was also glad to see some discussion in the report about the possibility of different tiers of warnings, and even different siren tones or patterns to get people's attention in situations that are truly more deadly. These are some things I touched on (particularly a two-tiered warning system) in a discussion I posted at the very tail end of July. Given the broad environment area of sizable low-level shear and large CAPE present at late afternoon over southwest Missouri on May 22, when significant storm rotation was detected on radar in that environment, particularly moving toward a populated area like Joplin, that would have been a good situation for the use of enhanced wording or even a "higher tier" of warning. And, even though the tornado developed very fast on the southwest edge of Joplin 17 minutes after a tornado warning with standard wording had been issued, it seems possible that if more urgent action had been performed rapidly around 5:40 pm when the first tornado reports were coming in (e.g., a "tornado emergency" statement or reissuing of the tornado warning with more urgent wording prompting continuous sounding of sirens at that point), some additional lives might have been saved. With the Joplin report now out, this is a good time and context to go back and look at the Joplin setting using SPC mesoanalysis graphics, which are generally good estimates of parameter patterns and ingredients useful in various types of weather forecasting. The first graphic above shows MLCAPE (mean-layer CAPE) and 0-1 km SRH (storm-relative helicity) graphics at 20 UTC (3 pm CDT) on 5/22/11 after the first storm had developed in southeast Kansas near Parsons (black arrow). Notice that while MLCAPE was quite large (> 4000 J/kg), 0-1 km SRH appeared rather unimpressive at this point (around 100 m2/s2). The 2nd graphic above shows the same paramaters, but 2 hours later at 22 UTC (5 pm CDT) about 30 minutes before the Joplin tornado. Notice that MLCAPE was still very large, but 0-1 km SRH had _increased dramatically_ ahead of the supercell complex approaching Joplin (black arrow), more than _doubling in value_ to greater than 250 m2/s2! Looking at a SRH/CAPE scatterdiagram (3rd graphic above), notice how this low-level shear increase moved the SRH/CAPE data point from below the red curve upward to _well above_ it. This trend was very important, probably helped by a surface low forming over southeast KS (4th graphic). This should have been noted by any mesoscale analyst working as support to radar/warning meteorologists in the southwest MO/northwest AR/northeast OK area that afternoon. Even though no tornadoes had occurred yet in the s.e. KS/s.w. MO area, such an increase would be a red flag for considering the use of enhanced wording in warnings (or a higher tier of warning, if such a system were implemented) based on any significant rotations detected on radar in such an environment, particularly if a very populated area (such as Joplin) were threatened. Let's contrast the Joplin setting with a situation that occurred at midday in Kansas City on 5/25/11, 3 days later. The last graphic above shows CAPE (11 pm CDT) and SRH (noon CDT), similar to the earlier graphics, though SBCAPE (surface-based CAPE) is used due to the "cold-core" nature (500 mb closed low nearby) of the setting where SB lifted parcels are typically more representative of true instability. 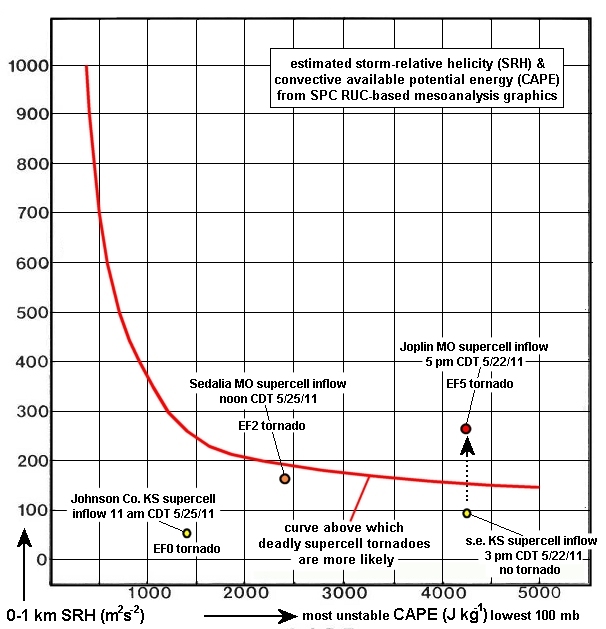 Note that SRH was quite meager (around 50 m2/s2), and CAPE was less than 1500 J/kg in the immediate Kansas City area (left black arrows in last graphic above), with the resulting position on the same SRH/CAPE diagram above far to the lower left _well below_ the red curve. Although it is quite possible to get small short-lived tornadoes in such settings, strong "cold core" tornadoes are almost always linked to settings with much larger SRH. Indeed, there were 2 or 3 reports of brief weak tornadoes from south to north across the KC metro area, but certainly no significant damage. Compared to Joplin, the threat over the Kansas City area was small in this situation. But tornado warnings with wording not much different than the intial Joplin warning 3 days earlier prompted several people in KC to call my wife Shawna and me in panic to ask what was going on, given that Joplin had occurred only a few days earlier. We told people to take cover and precautions, but that the risk was only a small fraction of what it had been for Joplin. This is an example of a situation where 2 tiers of warnings (and possibly different siren modes) might be useful in conveying the relative threat to the public. Admittedly, the Kansas City situation on 5/25/11 was complicated by the rapid increase in parameter values and support for tornadoes some 70 to 80 miles east-southeast of Kansas City, where a significant EF2 tornado hit Sedalia just after noon. 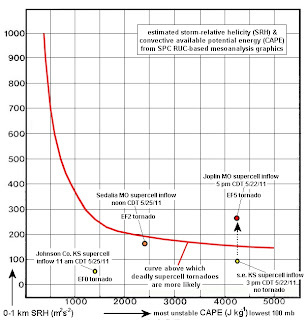 With SRH in the 150-200 m2/s2 range and SBCAPE near 2500 J/kg in the Sedalia area and southeastward (see right black arrows on last graphic above), the SRH/CAPE potential was very close to the red curve on the SRH/CAPE diagram above, signaling a much greater tornado threat there. So the May 25th situation was not a simple one to assess. But use of the tools above were definitely helpful in indicating the increased tornado threat and tornado risk as one moved well east and southeast of Kansas City. To be clear, I do understand and know that there are many, many tornado warning situations where it is essentially impossible to distinguish between warning and not warning using radar in combination with environment conditions... in those cases the environments are simply too "borderline" to make such calls given the knowledge and observing situations we have. BUT, there are also situations where tornado environment parameters are clearly impressive as thunderstorms form, suggesting increased risk of death and injury over larger areas. Those are the times when we need to do everything we can to convey the true risk to the public. I do also know that many people still don't seem to know the difference between a watch and a warning (maybe the term "alarm" instead of "warning", avoiding the "waa.." word sound confusion between the two words, would be better?). So I often get arguments that much of our populace is too "dumbed down" to deal with a 2-tier warning system. But is that really a reason to continue status quo in our current system when today's technology and knowledge can offer more information in many warning situations? That is something to think about. It's been 2 months since the horrifying Joplin tornado (death toll now 159), and 3 months since the shockingly deadly tornado outbreak in the Dixie states that killed well over 300 people. It now looks like 2011 will be the 4th deadliest U.S. tornado year on record. I don't think most people have any idea how jaw-dropping that is... one has to go way back before a coordinated tornado warning system was in place to find annual tornado death tolls of that magnitude! When big tornadoes hit cities, there will be deaths. And there have been many large long track tornadoes this year in populated places. But the staggering death tolls this year also raise some questions, including these: Are people getting complacent regarding severe weather preparedness? And do we now warn so much that warnings sometimes fall on deaf ears? A respected nurse at one of the hospitals in Joplin told me, "We get warnings and sirens all the time... we're, like, tone deaf... it's hard to take them seriously." I've heard many similar comments from other people. Severe weather education is a never-ending task that requires continued attention and priority, and getting people to listen and take action is deeply rooted in social science rather than meteorology. It is noteworthy that, compared to the 1980s, the number of tornado warnings in some parts of the U.S. (such as the Southeastern states) has increased at least seven or eight-fold, according to a recent article in the Birmingham News, while false alarms are averaging close to 80%. I know of no concrete social studies that have examined "warning fatigue" regarding tornadoes and severe weather. Yet I do agree with respected Birmingham TV meteorologist James Spann's recent comments that have stirred some controversy. I continue to see a number of tornado warnings issued in marginal settings where, based on years of data and increased operational knowledge about tornado environments, the atmosphere can only support, at best, weak or brief tornadoes. In those cases, the threat is considerably less compared to days like the Joplin tornado event this year, and the Dixie Super Outbreak. Yet it is often difficult to discern the relative degree of threat or risk in the text of many warnings, whether read verbatim or presented via media such as television. I know that the National Weather Service (NWS) and television/media meteorologists have a sincere desire to save lives and have the public know about all weather threats. Yet I wonder if we shouldn't reaffirm that we can't warn or cover all severe weather events. Instead, shouldn't we make a stronger effort to emphasize warnings in those weather settings that clearly have potential to be truly dangerous to many people in populated areas? I'm no expert in social science, but with my background in severe weather research, here are some comments from a meteorological perspective. The first graphic above shows combinations of low-level wind shear (storm-relative helicity or SRH) and instability (CAPE, or convective available potential energy). On the most simplistic/basic level, these are the most important environment ingredients linked to supercell tornadoes based on research over the past 25 years. On this graphic, I've plotted estimated SRH/CAPE points (using nearby RUC model analysis soundings) for 44 tornadoes that were associated with 4 or more deaths over the past 11 years. I've also drawn in a curve suggesting a rough lower "limit" to SRH/CAPE combinations that generally support tornadoes that can kill larger numbers of people; note that all events but one (98%) fell above this curve. Looking now at a much larger database (2214 supercell soundings I've collected over the past 11 years, 90% associated with NWS tornado warnings), the 2nd graphic above shows the percent and number of both non-tornadic and tornadic supercells (tornadoes shown by EF-scale intensity) falling near and above the red curve in the first graphic, suggesting more favorable SRH/CAPE combinations for strong/violent tornadoes. 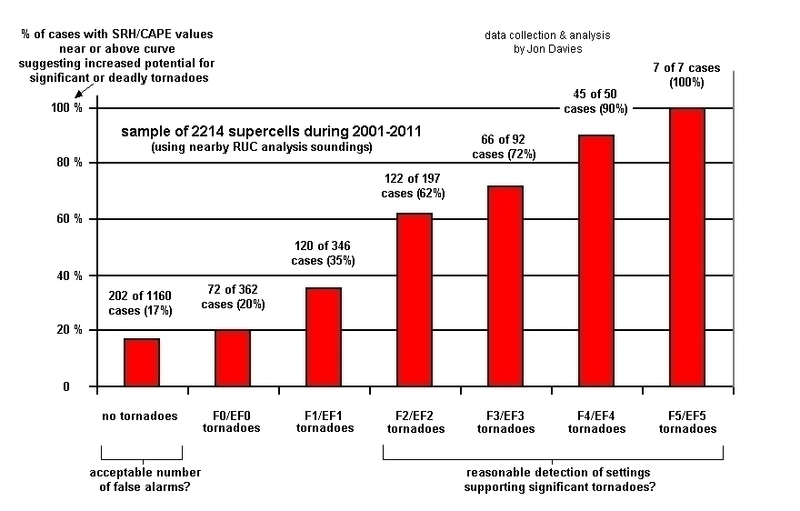 Notice that, using the discriminating curve suggested by the first diagram, only 17% of the non-tornadic supercells were "false alarms", falling near or above the curve but not producing any tornadoes. But moving over to significant tornadoes (EF2-EF5), notice that increasing majorities of these supercells fell into the more "favorable" area above the curve. Using only this simplistic SRH/CAPE scheme in supercell settings, this suggests workable false alarm and detection rates for supercell tornadoes, not even considering other ingredients such as deep-layer shear, cloud base height, amount of convective inhibition, storm motion relative to surface boundaries, etc., that have been found relevant in tornado forecasting research. This isn't really new information; forecasters at SPC have used SRH and CAPE combinations along with forecasts of other ingredients for years now when generating outlooks and watches for tornadoes. However, tornado environment ingredients seem to be used less consistently when actual tornado warnings are considered. 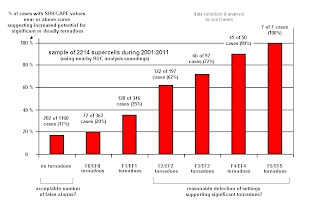 This is supported by the first column of the 2nd graphic above, where tornado warnings (not shown) were issued for 984 of 1160 non-tornadic supercells, yet the SRH/CAPE environment for 83% of these cases fell below the red curve in the first graphic above. Certainly, supercells in SRH/CAPE environments below the red curve do produce tornadoes, but when they occur, the large majority (80-85% according to my database) are weak (EF0-EF1 intensity). When thunderstorms form and become supercells, it is the environment area above the red curve where the probability of deadly tornadoes increases dramatically. My point is this: Shouldn't we place a much stronger emphasis on radar-based tornado warnings issued in settings where SRH and CAPE are in the area near and above the red curve in the first graphic above, even prior to confirmed spotter sightings? There are a variety of ways to work toward this, including better environment awareness by meteorologists (the SPC mesoanalysis page is a great tool in this regard) when issuing and presenting warnings, stronger wording and importance placed on warnings when environments are in the enhanced SRH/CAPE area, and making the public more aware that there are different levels of danger in weather settings. I know that many of my colleagues in the NWS work hard to incorporate environment information into tornado warning decisions, and that there are many times when it is very difficult to know when to hold back from issuing a warning, or to go ahead and "push the red button". Also, I know that meteorologists in today's media intensive society don't usually get rewarded for not warning in a marginal situation and avoiding a false alarm, but they are ruthlessly scrutinized when a notable severe weather event is missed. I'm not suggesting that we don't warn in marginal situations where tornadoes can still produce isolated damage and threat. I am saying, let's make sure to put the strongest emphasis on warnings in environments where ingredients appear more optimum for stronger supercell tornadoes, and try to be more clear about that to the public. A 2-tier warning system that would use an enhanced danger "red flag" in larger SRH/CAPE combination situations would certainly be a more radical solution, and require more public education. But this could help hospitals, factories, and public venues make more informed decisions regarding costly labor-intensive sheltering in the more dangerous situations, and possibly reduce apathy from "false alarms". It also might help emergency managers make more informed decisions regarding the use of sirens, maybe running them longer and more consistently in "red flag" situations, or using different siren tones to catch people's attention. Several of my colleagues have told me the above would be unworkable, and even confusing to the general public. That may be. But I do feel strongly that we can do more to help the public recognize warning situations that clearly have greater danger affecting more people. I can't avoid a strong sense that, with all the information and knowledge available to meteorologists today, we can do a better job conveying true tornado threats to the public and reducing false alarm perceptions that can engender public apathy. I think this is worth at least a look in this tragic year of tornado deaths. In a future post, I'll discuss some recent example cases that relate to the above discussion. I had intended not to write about so-called "cold-core" tornado settings (see this paper) for quite awhile, as most tornadoes associated with such settings are weak. Given the terrible death tolls from violent tornadoes in 2011, I feel the main focus should be on settings that produce stronger tornadoes and how we might reduce the number of deaths. But the prolific cold-core tornado event on Monday 6/20/11 in northwest KS and south-central/central NE was atypical; some of the tornadoes were strong in intensity (preliminary rating EF3, rare for tornadoes in a cold-core setting), so I felt a short write up might be justified here. Many cold-core events start relatively early (late morning or early afternoon) due to the strong dynamics and cold air aloft. The 20 June setting was no exception. The first tornado report came near Quinter KS at late morning just northeast of the surface low, and large tornadoes were in progress in the Hill City/Norton area of Kansas by early afternoon (see Mark "Storm" Farnik's impressive photos above near Long Island KS after 2:00 PM CDT, see also David Mayhew's awesome photo above from the same storm; go to this link for an incredible sequence of his images). Tornadoes continued along a corridor into south central NE with this and another supercell, and other tornadoes occurred at late afternoon with yet another supercell in central NE near York. All these tornadic storms were northeast of the surface low near the warm front/dryline interface, a typical focus area for cold core tornadoes with the closed mid-level low and associated cold air aloft not far to the west. What made this event so prolific with strong rather than weak tornadoes? I modified the RUC analysis sounding at Hill City at 1900 UTC (2 PM CDT, 3nd image above) for surface inflow parcels coming into the tornadic cell north of Hill City at that time on north or northeasterly winds (see surface observations northeast of the surface low on the surface map above at 1930 UTC). This resulted in an unusual amount of CAPE for a cold-core event, on the order of 2500 J/kg (most cold-core events are associated with CAPE values less than 1000 J/kg). In addition, 0-1 km storm-relative helicity (SRH) was sizable, in the range from 200 to 300 m2/s2 within a focused area ahead of the storm. This resulted in large energy-helicity index values (0-1 km EHI greater than 3.0, see 5th image above) in a corridor ahead of the tornadic storm, also unusual for a cold-core event. The sharp trough and tight closed mid-level low moving into the KS/NE area were unusually strong for mid to late June (see NAM forecast for midday above), a time when, unlike early spring cold-core events, large CAPE values can be present with surface dew points in the 60s F or higher. This large CAPE and SRH certainly provided support for larger and longer-lived tornadoes on 6/20/11 than typically associated with most tornadic cold-core events. NOTE: Cold-core events aren't defined by whether the storms are "mini-supercells"; yesterday's case featured larger storms that were essentially classic supercells because of the larger/deeper CAPE, contrasting with early spring or fall cold-core systems that may have surface dew pointsonly in the 50s F. The important issue is the _pattern_, with the closed low aloft that organizes intersecting boundaries in a fairly narrow corridor ahead of the surface low and cold air aloft as the midlevel system moves east or northeastward, setting the stage for potential rapid tornado formation. This is a common repeating pattern with cold-core systems that produce tornadoes, and can be very useful operationally in anticipating such events. An additional factor on 6/20/11 was probably steep low-level lapse rates in the vicinity of the tornadic storm at early afternoon over northwest Kansas. On the last SPC mesoanalysis graphic above, notice the axis of steep lapse rates extending through the surface "dry slot" over western KS into the environment of the northwest KS tornadic storm at 1900 UTC, along with plentiful 0-3 km CAPE. This combination could enhance stretching in low-levels that would already be rather strong due to the cold air aloft from the nearby midlevel low, even as cloud bases might rise some with this hotter/steep lapse rate surface air mixing in from the east from the surface dry slot (again, see surface map above). 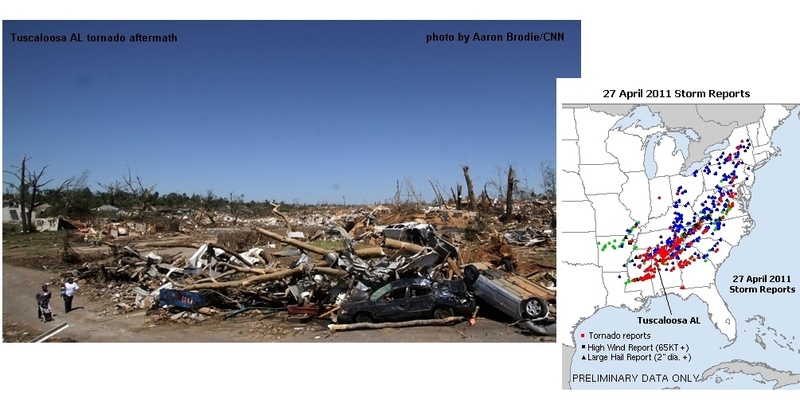 Indeed, many of the tornadoes formed quickly and were "dusty" (see the Mayhew and Farnik photos above), suggesting non-mesocyclone stretching processes similar to "landspouts", but combining with supercell processes involving strong SRH (see SRH field, also in the last graphic above). According to both Storm Farnik's and David Mayhew's descriptions, multiple dusty tornadoes were sometimes in progress simultaneously in close proximity, suggesting that enhanced low-level stretching processes were ongoing in the northwest KS storm environment northeast of the surface low. Thankfully, there have been no reports of injuries with any of Monday's tornadoes so far, even though damage as high as EF3 in intensity was observed with at least one of the tornadoes in northwest KS. 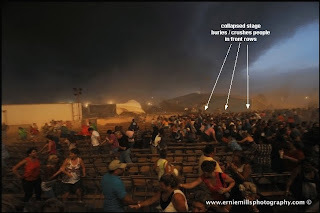 The death toll from last Sunday's horrendous and tragic EF5 tornado in Joplin, Missouri (see my prior blog discussion) is now up to 132 people, according to reports on Friday 5/27/11. As the deadliest single U.S. tornado in over 60 years, it is worth taking a brief look at the storm environment that helped generate it. The RUC analysis sounding for Joplin at 2200 UTC (5:00 pm CDT, see 2nd image above), an estimate of the environment roughly 40-45 minutes before the tornado struck, showed very large instability (MLCAPE > 4000 J/kg) and quite sizable low-level wind shear, with 0-1 km storm-relative helicity (SRH) near 300 m2/s2. This matched values shown on SPC mesoanalysis maps at 2200 UTC (not shown). On the same SRH-CAPE diagram where I plotted the Tuscaloosa AL tornado environment in a blog post a few weeks back (see 3rd image above), this combination of SRH and CAPE places the Joplin tornado environment in the same general area and magnitude on the diagram as the Moore OK tornado in 1999 and the Greensburg KS tornado in 2007, both rated EF-5 as well. Although the NAM 12-hr model forecast under-represented the energy-helicity index values (EHI, combinations of SRH & CAPE; see 4th image above), it did forecast a good estimate of the pattern, with an EHI maximum indicated over northwest AR and southwest MO. So it is not a total surprise that the tornado was so strong and deadly. What is a surprise is the huge death toll, which was partly a result of the tornado being rain-wrapped and very difficult to see (see my photo at top above), and the size of the tornado (around 3/4 mi wide) going down through a very populated area. Going back to the RUC sounding above, relatively weak winds of 40 kts or less at storm anvil level (around 300 mb or 30,000 ft and above) probably contributed to the high-precipitation (HP) rain-wrapped nature of the storm, allowing significant precipitation to fall in and around the updraft/mesocyclone area where the tornado was located, rather than being blown downwind away from the updraft. This seems a little unusual for an EF5 tornado, as most such environments I have examined (e.g., Greensburg KS and Moore OK) have had much stronger winds at that level, instead of the hodograph doubling back on itself with weaker winds in the 9-12 km AGL elevation range. This exacerbated the visibility issue on a day that was already hazy and murky with moisture and humidity, and may have fed into the number of deaths as residents could not get a visual sense of urgency until the tornado was almost right on them. Another possible ingredient that may have helped contribute to the tornado was a subtle WSW to ENE boundary that appeared visible in the low-level cumulus field on satellite at early afternoon across the Joplin area (see 4th image above). As the Joplin storm complex moved across or "phased" with this subtle feature, it might have provided some focus for the low-level wind shear and SRH to help spin up the tornadic circulation. But this is only speculation. The last point I'll make is the complex evolution of the Joplin storm, as can be seen in the radar images in the last graphic above. The original supercell and mesocyclone formed near Parsons KS, but began to fall apart shortly before 5:00 pm CDT over northern Cherokee County KS. At this time, three new cells were rapidly developing on the original storm's right/southern flank; two of these cells ("A" and "B" in the images above) quickly merged, while the southern-most of these newer cells ("C") generated a new mesocyclone around 5:15 pm CDT that prompted an NWS tornado warning for Joplin proper at 5:17 pm CDT. This new mesocyclone produced the Joplin tornado about 20-25 minutes later as it merged into the complex that had been cells A and B. The relevance, if any, of these complicated mergers and rapid evolutions to the intensity of the Joplin tornado is not immediately clear. It can be said that, with each new right flank cell raining into the one to its northeast and merging into the complex, this probably further created visibility problems that helped make the monster Joplin tornado even more deadly. This intensely tragic event has turned literally thousands of lives upside down. Please consider making a donation to one of several organizations assisting in the Joplin area. See http://www.cnn.com/2011/US/05/23/joplin.how.to.help. 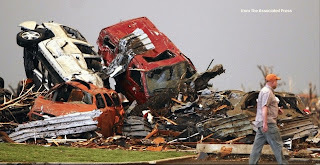 Update, Thursday 5/26/11: The Joplin tornado death toll has risen to 125, making it the most deadly single U.S. tornado since the Woodward OK tornado of 1947. Yet another outbreak of dangerous tornadoes occurred in the Oklahoma/Kansas/Arkansas area on Tuesday 5/24/11, killing several people. It is now one of the largest single city tornado death tolls in the past 70 years... 89 deaths and climbing. It is the 2nd deadliest tornado event in Missouri history (just behind the 1896 St. Louis tornado in number of deaths). Yesterday's tornado at Joplin, Missouri is yet another massive tragic event in this year of killer tornadoes and huge death tolls. Shawna and I drove through downtown Joplin minutes before the tornado hit. Sirens were going, but we could not see the tornado, and many people were out and about seemingly unaware or unconcerned. 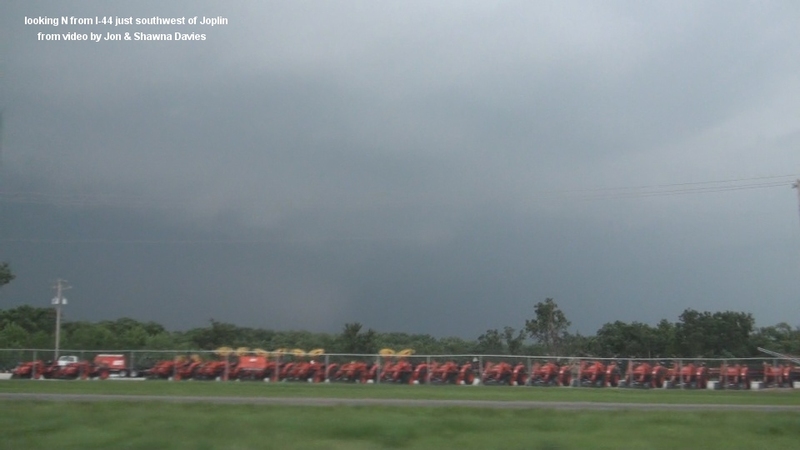 We had been following this storm complex for a couple hours without observing any tornadoes, and though we were a little nervous, we weren't anticipating anything of the magnitude that buried Joplin around 5:45 pm CDT. We blasted southwest on Interstate 44 to circumvent the approaching mesocyclone on radar that suddenly appeared very strong. As we looked to the north through the trees we caught a brief glimpse of the hard-to-see tornado (see images above, the second enhanced to make the tornado more visible). 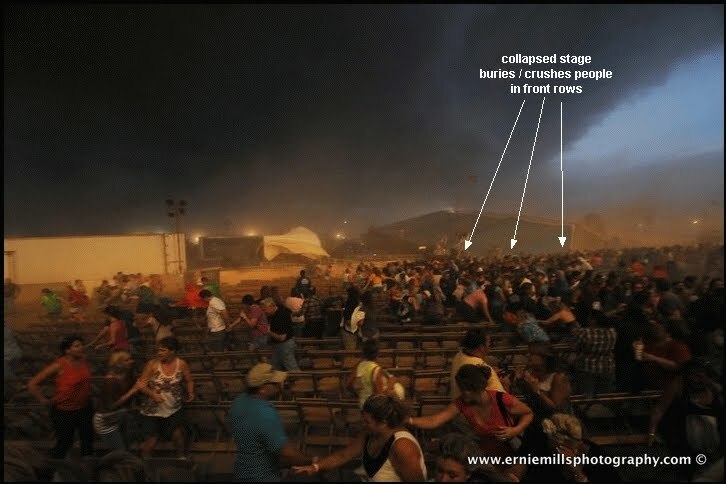 It was so large and the visibility so poor, that this may have had something to do with why so many people were killed. Shawna wrote a paper for one of her college classes back in April before the Dixie Super Outbreak on the 27th. In that paper she suggested that, while death tolls from tornadoes have dropped dramatically in the past 50 years due to better warnings and public awareness, that trend might soon begin to reverse again. She noted that "up-close-and-personal" tornado videos may be jading people's attitudes towards the dangers of tornadoes. And, with so many diverse information and entertainment sources distracting people's attention these days, the public may have increasing difficulty "hearing" warnings and grasping the importance of that information through the wall of "noise" produced by our information technology. Given what has happened in the past month, I wonder if she may well be right. Bonar Menniger's excellent book about the 1966 F5 Topeka tornado, "And Hell Followed With It", details how many people followed and heeded tornado warnings from TV and radio that day (there were only local stations focusing on local information back then). The death toll of only 17 from that evening in Topeka might in some ways suggest a more focused attention and response from the public regarding truly hazardous events back then contrasting with today. It is clear that the Joplin event was a difficult one to prepare for, with a rain-wrapped hard-to-see tornado forming just west of town when there hadn't been tornadoes from the same storm complex prior to that. And the tornado was huge and violent, around a mile wide going right down through a populated area. But with around 20 minutes of advance warning from the NWS, the death toll is still staggering, and leaves me pondering what could have been done to reduce it. I am so saddened this morning by what has occurred. 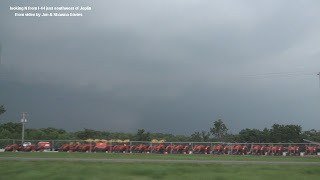 I will mention that there were a number of storm chasers who stopped to help with search and rescue in Joplin, including Tyler Costantini and Jay Cazel, Mira Lee, and the Cloud 9 tours group. That's awesome... all those who stopped and helped in the aftermath deserve big credit for doing so. Shawna's and my thoughts and prayers truly go out to all who have suffered losses in the tornadoes of recent days. 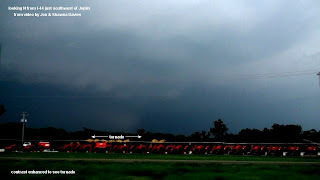 Severe weather turned deadly suddenly on Saturday evening 5/21/11 when a tornado struck Reading KS (northeast of Emporia) around dark, killing 1 person, injuring others, and destroying a number of homes. 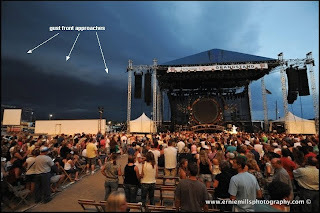 Jim Saueressig's photo above shows the impressive storm structure of the Reading storm after dark. The environment was one of the most rapidly changing that I've seen on Saturday. At late afternoon, the SPC Sig Tor Parameter (STP) was weak across eastern Kansas with marginal values due to both deep-layer shear and low-level shear being rather weak or marginal for tornadoes (0-6 km shear around 30 kts or less, 0-1 km storm-relative helicity/SRH < 100 m2/s2). This is why SPC issued only a severe thunderstorm watch for northeast Kansas. But by dark, low-level winds had strengthened and backed more than expected, causing much larger shear values, both in low-levels and through a deeper layer. This made STP values sky rocket as the eastern KS environment improved dramatically for supporting tornadoes. See the graphics above comparing STP over Kansas at late afternoon (2200 UTC) with just after dark (0300 UTC), and notice the change in wind profiles from late afternoon to after dark on local RUC analysis soundings at Topeka and Emporia. 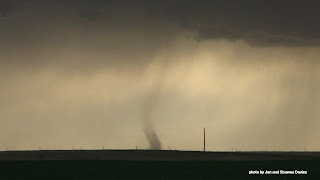 The tornado struck Reading around 9:15 pm CDT (0215 UTC), and other tornadoes from the same complex continued to be reported during the following 90 minutes after dark. Notice the RUC 0-1 km EHI and low-level CAPE forecasts above for 0300 UTC, indicating strong CAPE/SRH combinations _and_ a surface-based setting after dark, important ingredients for nighttime tornadoes. Shawna and I stayed in the local area north of Kansas City watching storms on Saturday evening, and were very saddened to hear about the strong tornado that hit Reading. After an enjoyable week of storm chasing with no deadly severe weather in the plains, last night brought things back to sober reality. Shawna and I are part of "The Great Tornado Hunt" on The Weather Channel with Mike Bettes and other Severe Studios chasers this month. This blog post looks briefly at the 3 severe weather settings we chased this past week. 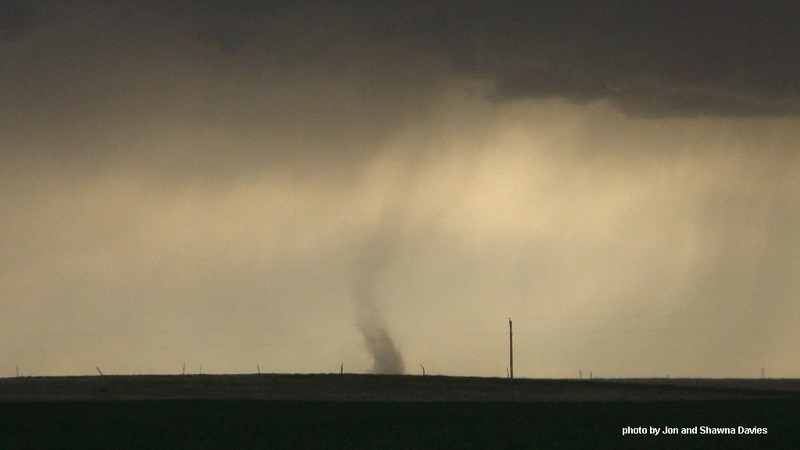 The first day involved a landspout tornado in Washington County, Colorado on Tuesday 5/17 west of Cope. We left Kansas City late morning and arrived in Burlington, Colorado late afternoon as a cell blew up west of Akron. Realizing we probably couldn't catch this cell as it headed northward too fast, we drove toward the dryline on I-70 and headed north at Siebert, not expecting much from the mushy looking towers to our west and northwest. One cell did develop a sharp high base, and as we approached Cope, Shawna spotted a dust whirl under it, 10-15 miles to our west. This became a landspout for a few minutes over open country (see photo above). We were lucky to catch it, but a later look back at the SPC mesoanalysis 0-3 km lapse rates and surface-based CAPE fields (see 2nd image above) at 2300 UTC showed the cell we were watching to be in a favorable location where a nose of steep low-level lapse rates (8.0-9.0 deg C per km) and decent SBCAPE values (500-1000 J/kg) were co-located with it on the dryline wind shift. Stretching on the boundary with these ingredients apparently set the stage for a mesoscale accident that we literally bumbled into. The original cell farther to our north was in cooler surface air and less steep low-level lapse rates. Colorado "magic" over elevated terrain is sometimes amazing, with dew points this day only in the low 40s F east of the dryline, but surface heating along the dryline helping to do something interesting! The next day (Wednesday 5/18) we were tempted to head from Burlington to western Oklahoma where much stronger instability than in eastern Colorado was located, but we weren't excited about the long drive. Looking at model forecasts of the pattern, I noticed that mid and upper level dynamics for lifting were forecast to be much stronger over Colorado, while Oklahoma was near a shortwave ridge at 500 mb / roughly 18,000 ft MSL (see maps in the 3rd image above). Much of that state was also located beneath or south of the southern branch of the polar jet, so I wondered if, even with all the instability, subsidence in that region might keep Oklahoma "capped", or at least keep storms there from intiating until after dark. Because Shawna and I don't get much opportunity to observe upslope storms, we decided to stay in Colorado, and were rewarded with a beautiful supercell that tracked from near LaJunta to Kit Carson, again over gorgeous wide open country (see photos in the 3rd image above). I have to admit we were both surprised that no storms at all developed in Oklahoma, even after dark. Our final chase day of the week was Thursday 5/19, with a potentially dangerous setting over southern and central Kansas. We started in thick fog that morning at Colby, Kansas, but drove to sunshine in Great Bend at mid afternoon near the intersection of the warm front and the dryline. Signficant tornado parameter values in this area were sizable (> 2.0-3.0, see 4th image above) as storms began to develop just north of Great Bend. But during our afternoon update online with The Weather Channel, both Shawna and Dr. Forbes expressed concerns about the rapid low-level transition in temperatures across the warm front in central Kansas, going from low 80s F to only near 70 F in about 30 miles or so. Shawna also felt strongly that supercells might become high-precipitation (HP) as they moved northeastward into the cooler air north of the front. I thought the tornado potential was significant, but once again my wife was right! As the cell we followed moved toward I-70, temperatures cooled and the atmosphere became more hazy, reducing visibility. By the time the storm approached Lake Wilson, it was HP in character and hard to see what was going on in the often rain-wrapped area of low-level rotation (see 4th image above). There were possibly some very brief tornadoes in there, but we could not see them, and I have not yet heard any reports of tornado damage from this cell. The contrasting RUC analysis soundings above (last image) at Great Bend and Salina on opposing sides of the warm front showed the issue: low-level convective inhibition (MLCIN) and low-level stability increased rapidly across the front, with large MLCIN making storms increasingly elevated the farther north they moved, even with large low-level shear (storm-relative helicity 300-400 m2/s2). With such a cool low-level thermodynamic environment north of the front, it turned out to be not a strongly favorable set up for tornadoes. When storm chasing, on most days there are things to learn and refine your knowledge with, if you pay attention :-). And thankfully, there were no strong/dangerous tornadoes in populated areas of the plains last week. Early this next week, Shawna and I will be heading out into the central and southern plains as potential for severe weather and tornadoes picks up again. Two weak tornadoes in Nebraska were the first I've intercepted on a "cold-core" storm chase in 5 years, and the first cold-core tornadoes my wife Shawna has seen. Cold-core systems are closed mid-level lows (at around the 500 mb level) that are pools of very cold air aloft, with just enough low-level moisture below them flowing in from the southeast to make the atmosphere notably unstable, although the surface moisture (dew points in the low to mid 50s F) may not appear all that impressive for tornadoes. This event was interesting in that it featured both a landspout tornado near Aurora NE, and a brief supercell tornado near Stromsburg NE. The surface map and satellite image above at mid-afternoon on Thursday showed a fairly typical cold-core setup (see this paper and this paper for more information about cold-core systems and tornadoes), with a surface low in south-central Nebraska just northeast of the mid-level low, and a boundary intersection area northeast of the surface low in the Grand Island-Aurora-York NE area. This boundary intersection area is often a favored location for tornado development, with a surface heat axis typically protruding in from the south for localized instability enhancement, and low-level shear and helicity often maximized in this area east or northeast of the surface low. The landspout occurred on a sharp dryline boundary visible on radar as a blue fine line (see third image above) near the boundary intersection area, via non-supercell/non-mesocyclone processes (see this paper). A high-based cell that developed and stetched vorticity on this boundary around 2130 UTC produced a sharp condensation funnel well above ground around 2150 UTC (4:50 pm CDT) that eventually made contact with the surface (see my photos above) with a dust column visible. A later brief tornado (see last image above) developed with a supercell and mesocyclone featuring much lower cloud bases and cooler surface temperatures farther northeast near Stromsburg around 2340 UTC (6:40 pm CDT) as the boundary intersection area and midlevel cold core system worked eastward. Video of this tornado by Dustin Wilcox can also be found here. This supercell was interesting in that the inflow temperatures were only around 60 F, and the cell structure was rotated 90 degrees counter-clockwise (inflow coming in from the north rather than the east, and the flanking line extending eastward instead of southward from the cell). This made for some spotting confusion at times as cell elements moved northwestward in upper flow ahead of the mid-level low, while new right flank development and eastward evolution of the surface boundary intersection area caused some eastward movement. NWS Hastings also has some information about the 5/12/11 events here. Thankfully, most tornadoes with cold-core systems are relatively weak (EF0 and EF1) in intensity, as was the case on Thursday with little or no damage reported. Tornadoes with cold-core systems are rather difficult to intercept, because if there are several cells in the boundary intersection area east or northeast of the surface low, it is hard to know which cell to follow and observe. There are also many issues that can keep cold core systems from producing tornadoes. For example, this same system the prior day on Wednesday produced supercells in northeast Colorado and northwest Kansas, but there were no tornadoes because all cells were occurring north of a sharp stationary boundary where the surface air (40s and low 50s F) was too cold for tornado development. Computer models are suggesting that yet another cold core system will affect the central plains around the period 5/18/11-5/20/11. 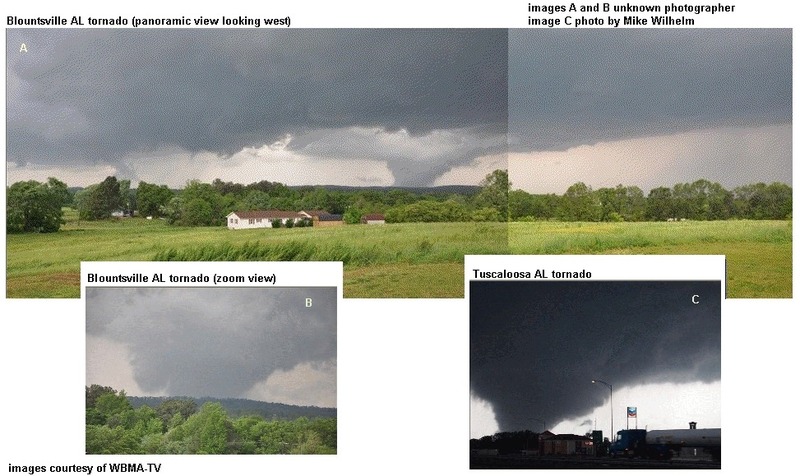 27 April 2011: An extraordinary environment for tornadoes. Last Wednesday's tragic and historic tornado outbreak (see photos above, and my prior blog post) was unprecedented in the past 75 years of U.S. history, topping even the 1974 "Super Outbreak." The number of deaths are now close to 340 people. It will take a while to sort out the actual number of tornadoes, with NWS surveys ongoing. At least one tornado has been rated EF5 so far (Sunday a.m. 5/1/11). Why were the tornadoes so strong, so numerous, and on the ground so long? Comparing the 27 April 2011 storm environment to years of tornado database parameters that I've kept, the setting for Wednesday's tornadoes was rare and quite extraordinary. The scatterdiagram (3rd graphic above) is from research I did with Bob Johns in the early 1990s (Bob is now retired from SPC). 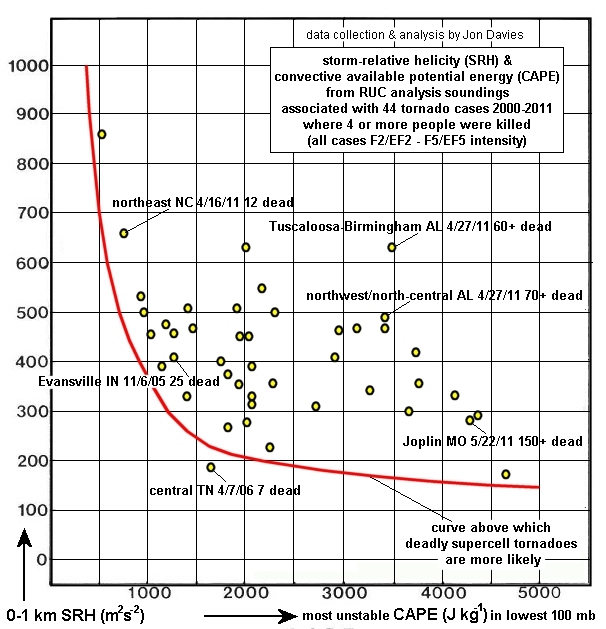 We looked at observed soundings associated with 242 F2-F5 tornadoes from the 1980s, and found combinations of storm-relative helicity (SRH, a new parameter at the time that quantitized low-level shear, developed by Robert Davies-Jones at NSSL) and CAPE to be useful in assessing environments with potential for significant tornadoes. Using that data, and with the help of John Hart at SPC, we came up with a parameter called the Energy-Helicity Index (EHI) using the diagram above. EHI is still widely used in tornado forecasting today to assess areas and combinations of SRH and CAPE that can support low-level mesocyclones and, hence, supercell tornadoes. For reference, on this same diagram above, I've plotted the estimated SRH/CAPE combination points for the deadly 1999 Moore OK and 2007 Greensburg KS tornadoes. 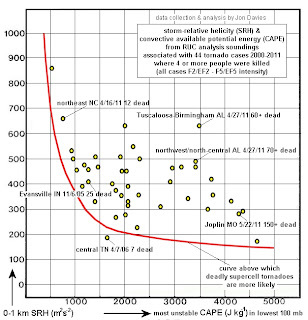 I've also plotted the SRH/CAPE environment corresponding to last Wednesday's violent Tuscaloosa AL tornado that killed nearly 40 people (also see the skewT diagram above). The Tuscaloosa environment location (large red dot) on the scatterdiagram is quite remarkable! It falls in the center and slightly toward the upper right in the area of most optimum SRH/CAPE combinations for tornadoes. Most telling, there are no points on the diagram to the upper right of the Tuscaloosa point, which makes it rather unique. I've looked through my own databases of tornado cases over the past decade, and can't find any tornado environment that even approaches this one (roughly 600 m2/s2 0-1 km SRH _and_ 3000 J/kg MLCAPE). Typically, if SRH is greater than 500, CAPE is less than 2000 (still a very good environment for tornadoes), or, if CAPE is greater than 3000, SRH is only around 200-300 (yet another very good environment for tornadoes). To have both the SRH and CAPE so large, during daytime heating no less (SRH values are usually largest at night with the low-level jet, when CAPE is not so strong), is quite rare and unusual. Given this information, and the fact that mid-level/500 mb winds were approaching 100 kts on Wedensday (excellent deep-layer shear in addition to low-level wind shear), it is no wonder that tornadoes were strong to violent and on the ground so long. The environment conditions where the storms formed and propagated were probably as optimum as we will ever see! The final graphic above shows 500 mb maps and 0-1 km EHI conditions approximated/forecast from the RUC model for Monday 4/25/11 (a notable tornado day in TX and AR) and Wednesday 4/27/11 (the historic outbreak). Notice how the midlevel trough stayed in place over the southern U.S. over several days (there were tornado episodes in the South from Sunday 4/24 through 4/27), with the strongest winds peaking on Wednesday (> 100 kts) in association with a strong negative tilt shortwave moving through the trough. Notice, too, from the EHI panels, how much SRH and CAPE were present already on 4/25, setting the stage for the peak combinations on 4/27 with the strong short wave and wind max moving through. The forecast EHI values on Wednesday p.m. 4/27/11 were very large over the MS/AL area, signaling the outbreak to come, though no one could know how historically deadly it would be. Even with the huge death toll, it must be said again that the National Weather Service and local media did a superior job on Wednesday with outlooks, alerts, and warnings. My heart truly goes out to those who have had their lives destroyed by these tornadoes. I hope anyone reading this will at least consider making a donation to help. See: www.cnn.com/impact.